Following the success of previous A Place in the Sun exhibitions, Worldwide Lawyers are excited to announce that we will once again be exhibiting at A Place in the Sun Live at Birmingham NEC on 25th-27th September 2015. If you are looking to buy a property abroad our advice is always “Research Research Research!”. A Place in the Sun Live is the official exhibition of the overseas property TV programme and is the ideal place to get the help and advice from industry experts that will equip you with the information you need to make informed decisions about your overseas property purchase. It is also the perfect place to find your holiday home, investment property or retirement pad abroad. At the show you will find private sellers, estate agents and developers offering thousands of beautiful properties around the world. Specialist zones for Spain, France, Florida, Italy and Portugal providing free specific buying advice. 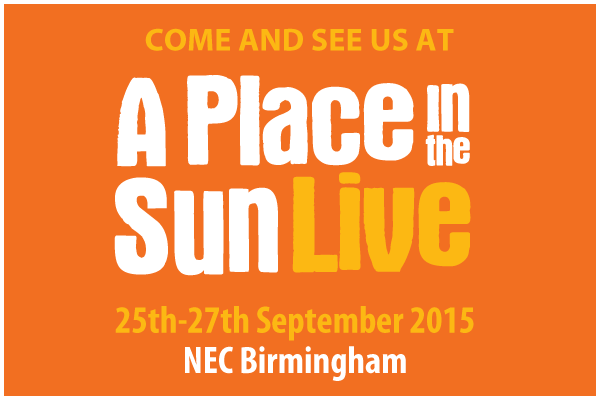 Worldwide Lawyers are currently able to offer some FREE tickets for the A Place In The Sun Live exhibition at NEC Birmingham on 25th-27th September 2015 – all you need to do is click on the A Place in the Sun picture bar below. So why not come and see us at A Place in the Sun Live and see how we can help with your overseas legal needs! WE WILL BE AT STAND E11.